The National Coalition for the Homeless has published its annual report on bias-motivated violence against people experiencing homelessness on December 21, commemorated as National Homeless Persons’ Memorial Day. Vulnerable to Hate: A Survey of Bias-Motivated Violence against People Experiencing Homelessness in 2016-2017, outlines the 48 lethal attacks and the 64 non-lethal attacks that occurred in 2016 and 2017 throughout the United States. The report discusses the structural violence that has created endemic poverty, and proposes legislative solutions to lawmakers and advocates working to protect people experiencing homelessness from violence. Combining statistics and narratives, Vulnerable to Hate provides an in-depth look at the types of crimes homeless individuals experienced in 2016 and 2017, from police brutality to stabbings. The report breaks down lethal and non-lethal crimes by state, and each crime is documented by city, date, and description. December 21, 2018 commemorates the 28th Annual National Homeless Persons’ Memorial Day, a remembrance of those who have passed away during the year while unhoused. Events are held nationwide to remember thousands who may not have had memorial services. A growing number of cities have been releasing annual reports on the number of community members who have died while homeless. Vulnerable to Hate only documents a fraction of these deaths. 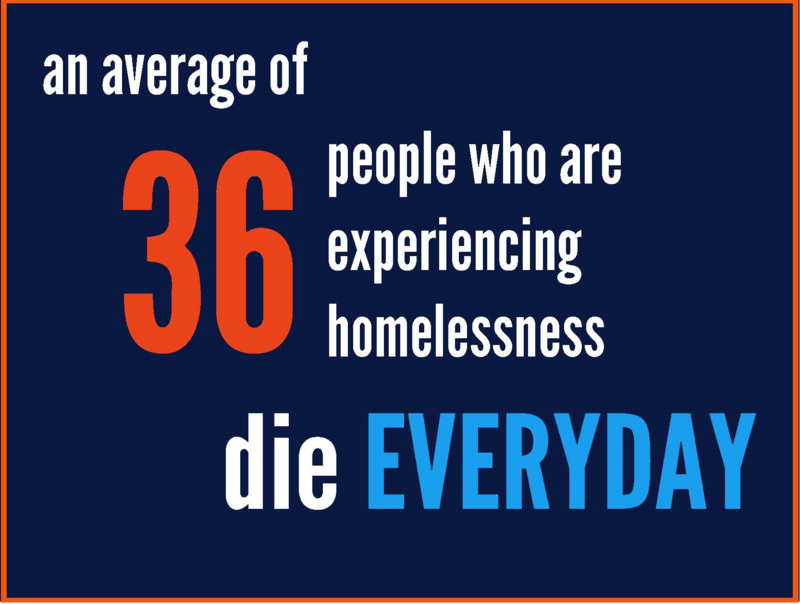 As the National Health Care for the Homeless Council points out, life expectancy for someone who is homeless can be 20-30 years younger than the general population. The National Coalition for the Homeless has estimated that annually, there are 13,000 individuals who die on our streets. This year’s Vulnerable to Hate report marks the 18th year the National Coalition for the Homeless has analyzed bias-motivated violence that leads to many deaths among the homeless community. The Federal Bureau of Investigation (FBI) has documented increases in reported Hate Crimes against federally protected classes since the 2016 elections. The numbers of attacks reported against people experiencing homelessness have decreased during this time. It is likely that as political views have bifurcated, bias against federally-protected classes has become more accepted or promoted in the mainstream culture. Still, the data collected by the National Coalition for the Homeless demonstrates that bias-motivated violence against homeless persons continues to be highly prevalent in our communities. California saw the most crimes against people experiencing homelessness in 2016 and 2017. In particular, a series of violent crimes in San Diego were committed by serial perpetrator John D. Guerrero, who was arrested for the murder and attempted murder of several homeless individuals. In one instance, a 23 year-old man, Dionicio Derek Vahidy, was doused in accelerant and lit on fire by Guerrero. This example highlights the randomized nature of the hatred homeless individuals experience. Federal and local legislation could help to prevent bias-motivated violence against people experiencing homelessness, adding housing status as a protected class under hate crimes statutes or vulnerable victims sentencing guidelines. However, as evident from the crimes outlined in Vulnerable to Hate, a cultural shift is needed to change how US society treats and values our homeless population, in order to prevent hate crimes and to build healthy and compassionate communities. For nearly three decades, advocates for people experiencing homelessness nationwide have taken one day out of the year to remember those who have passed due to the trauma of homelessness. 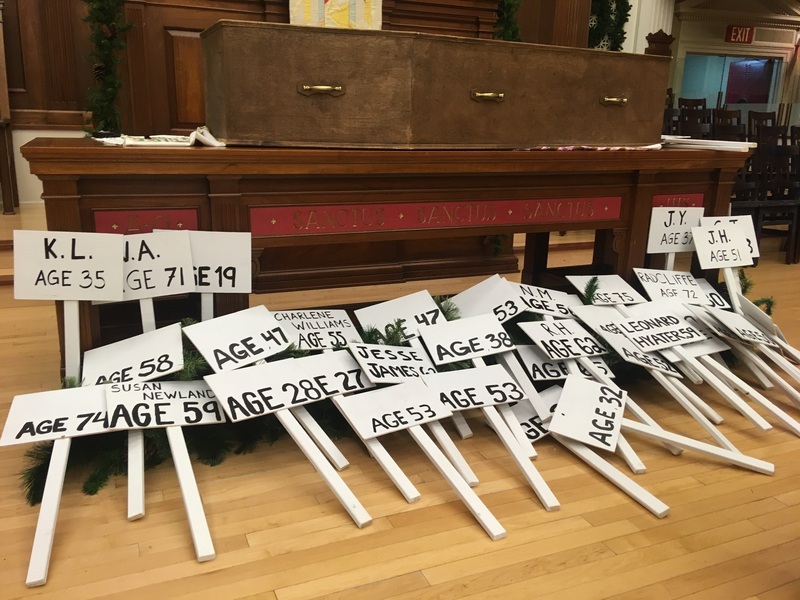 Symbolically commemorated on December 21st, the winter solstice and longest night of the year, National Homeless Persons’ Memorial Day serves as a reminder of the daily violence experienced by those who are without permanent housing. Every year, we mourn those we have lost and bemoan persistent homelessness that does not seem to be getting better. 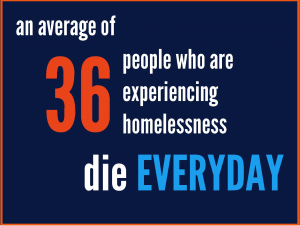 We have lost so many of our neighbors due to violence perpetrated by those who see people experiencing homelessness as less than human, or the structural violence that exacerbates easily preventable disease or shortens life expectancy by 20-30 years. I remember my fellow AmeriCorps volunteer and colleague Jesse, whose heart gave out after only a handful of years off the streets. I remember Cliff, the talented photographer and vegetarian, conscripted to eating American cheese sandwiches in the shelter, even as his health failed due to cancer. These, and so many others, were our friends, our colleagues, our family members, who became victims of a lack of affordable housing. The fact remains that a lack of housing is unhealthy, traumatizing and significantly shortens an individual’s life expectancy. People who experience homelessness have an average life expectancy of around 50 years of age, almost 20 years lower than housed populations. The Center for Disease Control (CDC) states that people experiencing homelessness are at a greater risk of infectious and chronic illness, poor mental health, and substance abuse. They are also more susceptible to violence once experiencing homelessness, a fact confirmed by over 20 years of reports on bias-motivated crimes against people experiencing homelessness showing 1,769 reported acts of violence against people experiencing homelessness, 476 of which were lethal. In 2017, there were 22 cities that reported the number of people experience homelessness who lost their lives without a place to call home. Out of those cities that reported, 2,525 homeless community members passed away. Consulting reports about deaths of people experiencing homelessness in 2016, we estimate that at least 13,000 people pass away each year while without housing. Homelessness is the most extreme expression of structural housing poverty. This form of extreme poverty hasn’t always existed at the levels we see today, and doesn’t have to be a permanent state in all of our communities. We need to invest in our shared humanity through investment in publicly affordable housing. We need to build healthier and more compassionate communities, that ensure all residents’ basic human needs are met. May this Memorial Day be a reminder to all of us that working together, we can build our housing infrastructure, and reinforce our safety net of food, cash, medical and housing assistance, so we don’t lose another brother and sister to the streets. We invite all of you to register your Memorial Day events at https://nationalhomeless.org. If you are not able to host your own event, please participate in a nearby event to memorialize our fallen community members that passed away without the dignity to have a place to call home. Homeless Persons’ Memorial Day is co-sponsored by the National Health Care for the Homeless Council and the National Coalition for the Homeless. The National Coalition for the Homeless is deeply saddened by the recent senseless attacks on men sleeping outdoors in San Diego that have left three dead and one more critically injured. But we are not surprised. Over the last several months, San Diego has been sweeping homeless encampments, constantly displacing residents who have nowhere else to go and disposing of items of personal and survival value. Quietly, the city laid down boulders beneath an overpass, on a side walk often used by houseless folks to rest. Should any of us be surprised that a high school cheerleader was recently charged, along with two teenage brothers, in the beating death of a homeless man just outside of the city? In the early 1990’s, the National Coalition for the Homeless noticed that a growing number of cities were passing ordinances banning everyday activities carried out by people who were homeless. Bans on panhandling, camping, or even sharing food in public places have since become common place in cities across the country, just as poverty and homelessness have been increasing. No Safe Street: A Survey of Violence Committed against Homeless People a new report published by the National Coalition for the Homeless finds that over the last 17 years, at least 1,657 people experiencing homelessness have been the victims of violence perpetrated for the sole reason that they were unhoused at the time. This number includes 428 men and women who lost their lives for being homeless, and in the wrong place at the wrong time. It is easy to see a correlation between the appearance of laws criminalizing homelessness, and the increase of hate crimes or violent acts against homeless people. A 2014 report from the National Law Center on Homelessness and Poverty found that out of 187 cities that have enacted some type of law criminalizing daily activities often carried out by people without stable housing, 21 cities were located in California (11%) and 17 were in Florida (9%). No Safe Street finds that out of 199 attacks against homeless persons in 2014-2015, the largest share of incidents took place in California (43 attacks) and Florida (18 attacks). One possible explanation for this is the message that criminalizing homelessness sends to the general public: “Homeless people do not matter and are not worthy of living in our city.” This message is blatant in the attitudes many cities have toward homeless people and can be used as an internal justification for attacking someone. Moreover, in communities across the country (except for a handful of progressive cities and states), it is perfectly legal to discriminate against someone who is unhoused in employment, housing, or even in delivery of health or social services. What message are our municipalities sending to their residents? As we have attempted to legislate homelessness out of sight in our communities, we have created a hostile environment for people who fall on hard times. Social services have not kept up with the pace of need, and in many cases have been cut or restricted. Instead of responding with compassion and generosity, on the whole, our communities have responded with prejudice and judgement. Study after study has found savings for public services when someone is housed versus homeless. In fact, the University of Denver’s School of Law released a report earlier this year which found that just six Colorado cities have spent more than five million dollars enforcing 14 anti-homeless ordinances over the last 5 years through policing, court and incarceration costs. Our failure to end homelessness has only brought financial and human costs to our communities. As we look towards a change in our federal leadership, the National Coalition for the Homeless calls on our fellow citizens to prioritize compassion over comfort. The solution to homelessness, and the best method for preventing further violence, is simple: housing. View more about Hate Crimes against people experiencing homeless.